Let the revolution begin: Jean-Paul Marat and the Marquis de Sade go toe-to-toe in this play-within-a-play. In 1790, French Revolution-era firebrand Jean-Paul Marat wrote to his readers, "Five or six hundred heads cut off would have assured your repose, freedom and happiness." Yet while Marat wrote of violence, he was not violent himself. A journalist, physician and anti-monarchist politician, he preferred the pen to the sword, and when he was murdered, the scene of the crime was not a battlefield but a bathtub. The tub in question is the most memorable location in Twilight Theater Company's production of Peter Weiss' Marat/Sade, a dizzying play within a play that imagines the end of Marat's life. It's deliberately chaotic and occasionally baffling, but also a provocative spectacle that happens to be zany fun. 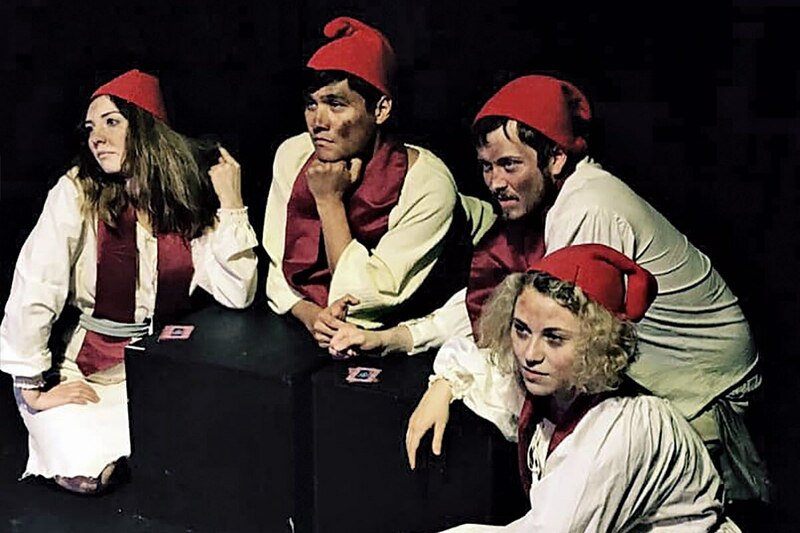 The story, directed by Dorinda Toner, starts as a group of fussy nobles prances into an asylum to watch a show about Marat by the Marquis de Sade (Randy Patterson). Playing himself, de Sade acts opposite his fellow inmates cast as characters, including Marat (Greg Prosser) and his eventual assassin, Charlotte Corday (Eva Andrews). Like bickering children at opposite ends of a teeter-totter, de Sade and Marat sit on either side of the stage fighting about the merits of an uprising. As tempers flare and Marat's resolve slackens, we see France's revolutionaries and counterrevolutionaries figuratively and literally caught in the middle of the debate, their lives unfolding in the center between the two men. While it's possible to imagine Marat/Sade as a pure political drama, the play is also a musical comedy. The songs comprise delightfully ludicrous lyrics such as, "Out with the priests and let them live on their fat," and even the heady war of words between de Sade and Marat has comedic verve. A speech from de Sade about the futility of revolution, for instance, quickly goes from somber to silly when he insists on removing his shirt and speaking while a woman flogs him with a cloth. Marat/Sade has the potential to go disastrously awry—when it was revived by the Royal Shakespeare Company in 2011, a reported average of 30 people a night walked out. Yet Toner and her excellent cast and crew have developed a creative approach that is both entertaining and bold. The production's enjoyably over-the-top performances are delightful, but the story never forsakes Marat's transgressive spirit. There are moments when lack of control becomes a problem for Marat/Sade. Weiss' script is occasionally confusing—in one scene, a crowd goes from screaming at each other about Marat to cheering his name with little explanation—and as diligent as Toner and her cast are, they cannot make sense of the narrative's weaker points, including its muddled exploration of Corday's ideology. Organized chaos is one thing, but there are moments when the play descends into sheer anarchy. That might, of course, be the point. And despite its flaws, this production of Marat/Sade is animated by its impressively sincere belief in the necessity of transformative political change, as evidenced by a twist that not only catches you off guard, but violates one of the most sacred traditions in theater. It's a powerful moment that underscores the production's credo—that we all need to get out of our seats and confront the political reality around us. Otherwise, you might be the one caught in the bathtub. SEE IT: Marat/Sade plays at Twilight Theater Company, 7515 N Brandon Ave., twilighttehatercompany.org. 8 pm Thursday-Saturday and 3 pm Sunday, Oct. 25-28. $15-$18.